How Much Are AMEX Points REALLY Worth? How much are your points really worth? It’s an important question to answer to help you gauge which cards can get you the most bang for your buck! Luckily, AMEX Membership Rewards points are really easy to earn and have a TON of value! Once you earn AMEX Membership Rewards points, you’ll want to redeem them for the best value you can. You can get between 1 cent and 5 cents value per AMEX Membership Rewards point on average, with redemption values even higher with a little research! AMEX Membership Rewards points are easy to earn from cards like The Platinum Card® from American Express and The Blue Business℠ Plus Credit Card from American Express. 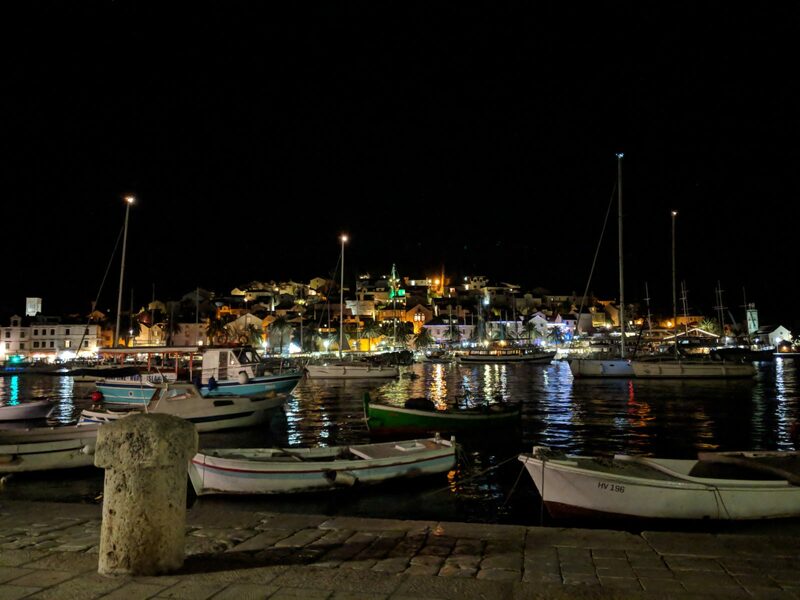 Use American Express Membership Rewards Points to Enjoy the Nightlife in Hvar, Croatia! Let’s look at the best ways to redeem AMEX Membership Rewards points and see how much they are really worth! The Platinum Card® from American Express – One of the best premium travel cards out there with the most lounge access! What Value Can You Get When You Redeem Your Points for Cash Back? If you want to quickly redeem your points for cash or gift cards, AMEX gives you the option to do so online. However, I would typically avoid doing so as you don’t get optimal value for your points. If you use your points to pay your statement balance, you’ll only get 0.6 cents per point which is terrible. Gift cards are a little better as you’ll get 1 cent per point value on some gift cards, while others cost closer to 0.8 cents per point. What Value Can You Get When You Book Through the American Express Travel Portal? The American Express Travel Portal allows you to turn your points into free travel! You can log into your AMEX account and book flights, hotels, car rentals and more using points, cash, or a combo of both. The AMEX Travel Portal lets you redeem your points for airfare at a rate of 1 cent per point. For example, you can book a $200 round-trip flight from Washington, DC, to Orlando for 20,000 AMEX Membership Rewards points. Nice and simple. However, one great perk of the AMEX Business Platinum Card is that you can actually get points back when you book flights using points! That’s because AMEX gives you 35% of your points back for ALL First Class or Business Class flights booked through the AMEX travel portal using Pay With Points or 35% of your points back for all flights, including coach tickets, booked with your selected airline through the AMEX travel portal using Pay With Points (up to 500,000 points per calendar year). That means if you book a $1,000 flight (100,000 points) through the portal when you have the Business Platinum Card, you’ll get 35,000 points in return, which means your flight really only cost 65,000 AMEX points! American Express is essentially giving you a 35% discount for flights when booking with points! Redeem Your AMEX Points for Free Travel Using the AMEX Travel Portal! Keep in mind, you’ll only get a value of 0.7 cents per point when you redeem AMEX Membership Rewards points for other travel through the portal, like hotels and car rentals. What Value Can You Get From American Express Transfer Partners? Transferring your points to one of AMEX’s transfer partners is a great way to get the most value for your points! That’s because typically the points needed to book a flight or hotel are fixed, while the price in cash can vary wildly depending on factors like time of year, day of the week, etc. Below I’ve listed some popular AMEX travel partners and the typical value per point you’ll get when moving points to them. One thing to keep in mind is unlike Chase Ultimate Rewards, some AMEX Partners do not transfer at a 1:1 ratio. For example, when transferring to JetBlue, they transfer at a 250:200 ratio. That means if you need 10,000 JetBlue points, you’ll need to transfer 12,500 AMEX Membership Rewards Points. Note: Transferring your AMEX Membership Rewards points to Marriott/SPG, Hilton, or Choice Hotels is not usually a good deal. Here are a couple of examples of Big Travel with AMEX Membership Rewards points. ANA (All Nippon Airways) offers amazing value, especially when flying in Business Class! One of my bucket list trips is to go to Japan. ANA offers a great sweet spot when traveling from North America to Japan for 75,000 to 90,000 points round-trip in Business Class! 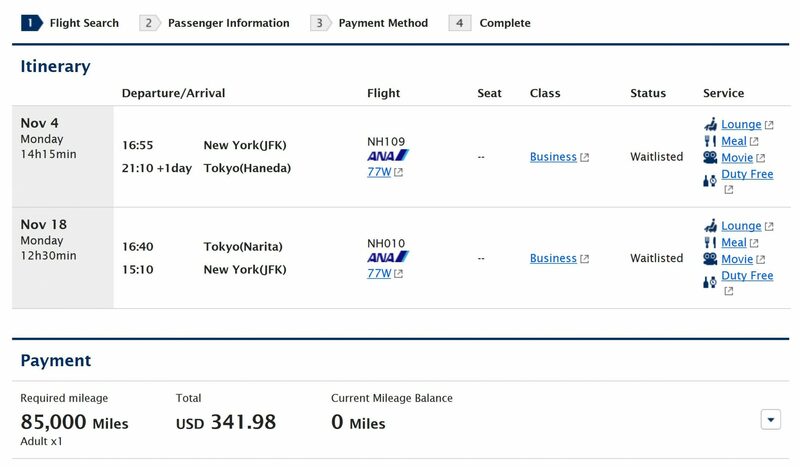 A Business Class flight from New York to Tokyo could otherwise cost over $6,000! Booking a Business Class Flight With Cash Is Way Out of My Price Range! 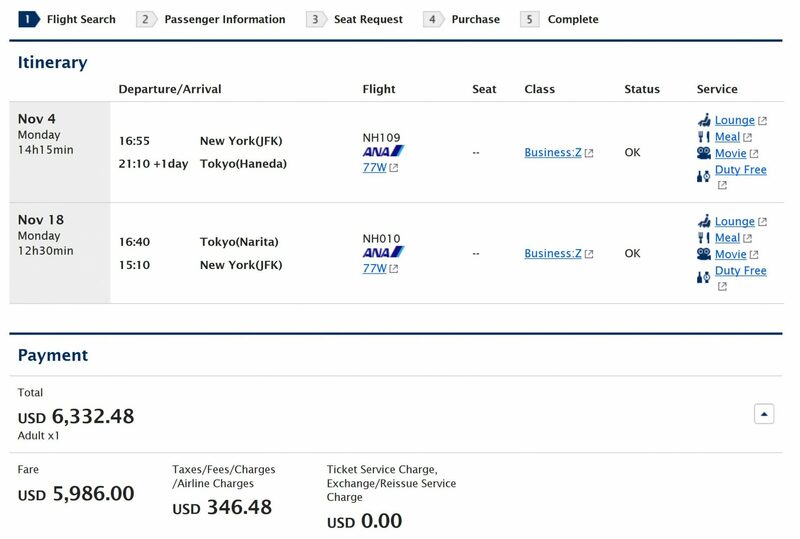 You can see below I found non-stop, round-trip flights from New York (JFK) to Tokyo for ~$6,332. However, if I were to book the same exact flight using points, I’d only be spending 85,000 points plus taxes and fees. I would just transfer 85,000 AMEX points to my ANA account and book the flight. I would receive a value of ~7.5 cents per point (~$6,332 cash price of the ticket / 85,000 points). That’s 6.5 cents more value than I’d have received if I redeemed my points for cash back. Transferring Points From AMEX Couldn’t Be Easier and the Value You Can Get is Incredible! I would never be able to afford flying in business class if I were paying in cash, however, by transferring points it’s actually something I can afford! An example of a booking I might consider making in cash is flying JetBlue domestically. For example, I found a round-trip flight on JetBlue from Boston or Orlando that costs ~$447. However, I found that when I looked to book via points, it costs only 28,700 points. That would give me roughly ~1.6 cents per point value. However, remember that AMEX points transfer to JetBlue at a 2.5:2 ratio. So, if I were to pay for this using AMEX points, I’d need to transfer 35,875 AMEX points over to my JetBlue account. Now, my value drops to ~1.2 cents per point. I do get some additional value by transferring to a partner, but I’m not getting the same bang for my buck as I did with the ANA flight to Tokyo. I’ll probably book this flight in cash and earn more points and instead go ahead and book a really great value down the road! However, Free Is Free. In This Example I’d Be Able to Fly From Boston to Disney World for Just the Cost of Taxes and Fees! Every so often Amazon partners with American Express to offer some extreme value for AMEX Membership Rewards points. Team member Jasmin wrote that last month she got $55 worth of discounts on Amazon by using only 2 AMEX points. That’s a value of $27.50 per point! Of course these are limited offers, however, it can be a great way to save money on Amazon since you only have to use 1 point typically to get the discount – then just pay for the rest of the order in cash. A few months ago, AMEX was offering 20% off Amazon orders when using 1 single AMEX point. I was able to maximize this by spending $500 on Amazon and getting $100 off! That means I got $100 for using 1 AMEX Membership Rewards point when making my purchase! How Should YOU Use Your Points? At the end of the day, it really comes down to how you want to spend your American Express Membership Rewards points! Maybe you’ve been dying to go to California and even though you may only getting 1.5 cents per point, you are still getting a free flight! That is definitely worth it to me. Or maybe you’ve been hoping to go on a Carnival Cruise and you have 20,000 points you’d like to put towards your dream trip. Go ahead and buy $200 worth of Carnival gift cards through your AMEX Rewards portal and get on that cruise for $200 less than you normally would have! Or maybe you just want the simplicity of using the AMEX Travel Portal to book flights or hotels and using your points to pay for your travels. AMEX Membership Rewards points are really flexible and give you a TON of options. There’s no right way to make the most of your points. Any travel you book using AMEX points is free travel that you get from rewards on purchases you’d be making anyway! AMEX Membership Rewards points are extremely flexible. That flexibility is exactly what makes it so tough to pinpoint their exact value with a single number. You can get anywhere from 0.3 cents per point to 7 or 8 cents per point depending on how you redeem your points. I’d estimate that you’ll average a value of ~2 cents per point. When you add that to the fact that you can get up to 4X or 5X AMEX points on purchases, you are effectively getting 8 to 10% back in certain categories. You’ll usually get the most value per point by transferring points to AMEX airline partners, like ANA or Air Canada Aeroplan. AMEX Membership Rewards points are easy to earn with cards like The Platinum Card® from American Express and The Blue Business℠ Plus Credit Card from American Express. Can i buy Disneyworld tickets with my reward points ? Lol. Did you actually value Hilton points higher than Marriott? I love Amex points, though I must say I prefer Chase points slightly more then Amex points. This mostly comes down to how easy Chase points are to use for travel redemption. There is one cash-out method you didn’t mention, and that’s if you have the Schwab Amex Platinum, you can cash out your points for 1.25 cents. This is a huge advantage for those seeking cash back! Thanks for sharing! AMEX points are one of my favorites too because I can transfer them to a number of airline partners. To me they’re worth roughly the same as Chase points, based on a small handful of trips I’ve planned, but to each their own!